Entries from Digital Intelligence tagged with "blackberry"
Blackberry will no longer make handsets, as the once market leading smartphone pioneer shifts focus onto software, such as its BBM chat app. Facebook has dropped support for BlackBerry phones, leaving users unable to connect to the social network through apps. New research from Strategy Analytics has revealed that the Android OS accounted for 85% of the 295m smartphones shipped worldwide during Q2. In contrast Apple, Windows Phone and BlackBerry all saw their market share decline, as Android performed well on both low-cost and high-end devices across the World. Blackberry has made a surprise U-turn on its planned $4.7bn (£3bn) sale to consortium Fairfax Financial, instead replacing its chief executive and raising $1bn from investors. BlackBerry has launched out its popular BBM instant messaging service on other operating systems, but users who did not pre-register will have to wait in line. Facebook, Instagram and Twitter are the most popular social media sites among 10-15 years olds in the UK, but Blackberry is falling from favour, according to new research. The Amaze Generation from Amaze on Vimeo. BlackBerry has been sold to a private equity consortium for $4.7bn (£2.9bn), as the struggling phone maker looks to turn around its fortunes. Blackberry is to lay off 40% of its global workforce, following second-quarter losses of almost $1bn, as the former smartphone market lead struggles to compete with the likes of Apple and Android. This chart shows the percent change in global market share for smartphone operating systems between 2012 and 2013. Android has reported the biggest growth in market share with a 15% increase. This growth can be attributed to the variety of phones that are Android enabled. iOS, which is only available on the Apple iPhone, dropped in market share by nearly 5%. 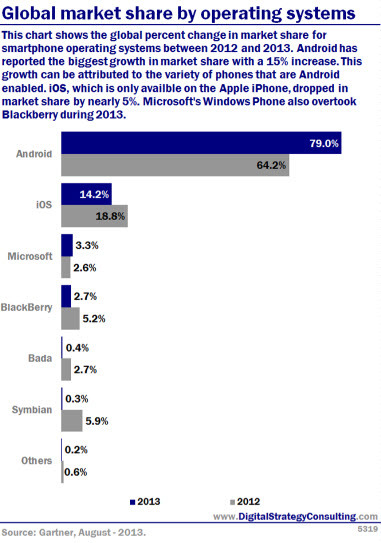 Microsoft's Window's Phone also overtook Blackberry during 2013. Blackberry is planning on going private, as the embattled phone maker looks to turn around its fortunes with a major shift in strategy, according to a news report.